Speaker Malcolm Dale, Probus Club chairman Richard Hawkins and the proposer of the vote of thanks Mike Denham. 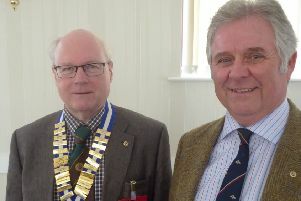 Pocklington Probus Club chairman Richard Hawkins welcomed members and a prospective new one at the latest meeting. After a little club business, speaker Malcolm Dale was introduced by Mike Denham. Mr Dale then gave a most interesting address about his life as a long-distance lorry driver. He briefly described the birth and growth of the long-distance haulage industry. As the design of heavy-goods vehicles improved it became possible, especially in Europe, to replace shipping with fleets of lorries. This resulted in a great reduction of damage to goods and much quicker delivery. The advent of refrigerated vehicles also made it much easier and more efficient to transport perishable goods. After the UK became a member of the EU a further advantage became evident in the reduction of the paperwork needed to transport goods across borders. He gave graphic descriptions of the way roads had changed through the years as motorways developed. However, on the long-hauls to places such as Turkey passage through mountain passes can still be hair-raising. Sometimes delays at borders do occur – he had on one occasion to stand located at one place for so long that he ran out of cash. He was befriended by a kind lady from the drivers’ cafe at the border, who let him have free meals but presented him with a bill when he left, which he paid on his next visit. His audience was very interested in his experience and plied him with pertinent questions, after which he was sincerely thanked.